Cardinal Wolsey has just been dismissed as Lord Chancellor for failing to obtain an annulment of King Henry's marriage to Catherine of Aragon. Thomas More is named as Wolsey's replacement. More presides over Parliament, which the king hopes will somehow find the means to invalidate his marriage, thus freeing him to marry his new love, Lady Anne Boleyn. Apart from matters of the heart, matters of state also apply, for Henry has no male heir to carry on the Tudor line, and Queen Catherine has passed her child-bearing years. But will Parliament be content with solving the king's marital and dynastic problems? For there are some in Parliament who wish to use the royal divorce to disempower the English church, to sever its ties to papal Rome, and to change it doctrinally from Catholicism to Protestantism. Others are against the divorce, against supremacy and independence, and against this heretical creed filtering in from the Continent. More is their leader, for as long as he can survive. Thomas Cromwell leads the king's party. The king is ambivalent about the reformation unleashed by his "great matter," as the divorce campaign is called, and so the conservatives are free to prosecute reformers as heretics, while the reformers are free to prosecute conservatives as traitors. Victory is up for grabs, because the king's party is in fact a coalition of three dissimilar factions whose members are further divided by personal ambitions and jealousies. At issue is the clash of four contending ideas: medieval Catholicism, Lutheranism, Renaissance humanism and Machiavellian statecraft. John Patrick Coby is professor of government at Smith College, where he teaches courses in political theory. He is the author of four books and of numerous scholarly articles and reviews. 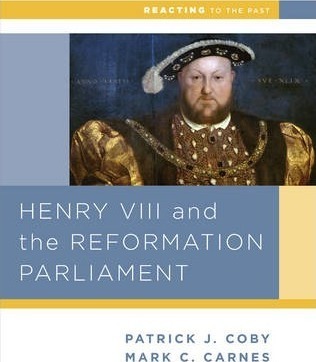 His books are Socrates and the Sophistic Enlightenment: A Commentary on Plato's Protagoras; Machiavelli's Romans: Liberty and Greatness in the Discourses on Livy; Henry VIII and the Reformation Parliament; and Thomas Cromwell: Machiavellian Statecraft and the English Reformation. He has just finished a fifth book, America's Founding: The Constitutional Convention of 1787. He is the recipient of three teaching prizes: the Smith College Faculty Teaching Award, the Sherrerd Prize for Distinguished Teaching, and the Board of Trustees Honored Professor Award.